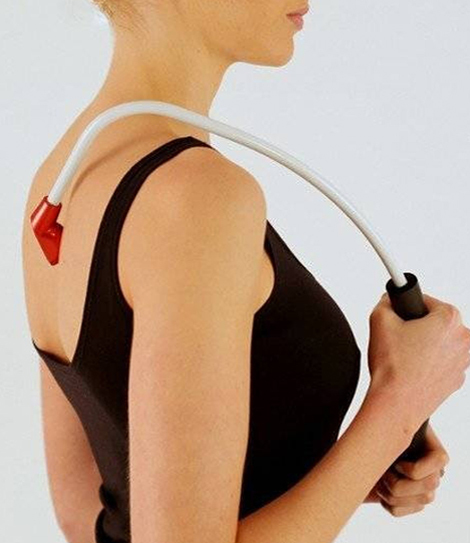 The Back Nodger is a uniquely designed hand-held device, created for users who suffer with niggling aches and pains in areas that you can't reach with your own hands. It is small and light enough for you to use out and about or even while travelling. If you suffer from persistent back pain consider using the Mobiliser. Common muscular niggles such as tight shoulders, a stiff neck or a sore lower back can often go untreated and they are usually caused by simple everyday activities such as sitting at a computer, carrying heavy bags, exercising or even just running around after kids. The Back Nodger is light and portable, allowing you to take it wherever you go. No batteries required, so you can get nodging whenever you feel the need. Back Nodger should feel like a masseur's thumb pressing deep into those niggling sore spots in all the places you can't reach. Hold the handle with 2 hands. One above the other. Relax your shoulders and inhale deep through your nose. Exhale and relax, keeping shoulders down and elbows in. Apply targeted pressure into the knot by levering the bottom of the handle away from you, using the top hand to control the position. Increase the pressure for 1 deep breath cycle in and out (about 5-10secs). Move the Back Nodger head to a different spot within the same knot or on to a new knot. Remember to increase your water intake to remain well hydrated.